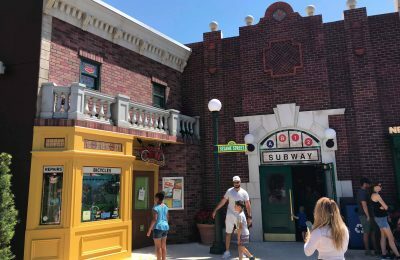 IAAPA, which is short for the International Association of Amusement Parks and Attractions, took place this week at the Orange County Convention Center this week. The trade floor opened Tuesday morning, and was be open daily through Friday. The trade floor had more than 1,100 booths this year with more than 25,000 industry professionals in attendance. With so much to see and so many interview possibilities, it is literally impossible to see everything and talk to everyone, so we picked several booths we thought you, our readers, would be most interested in hearing about. 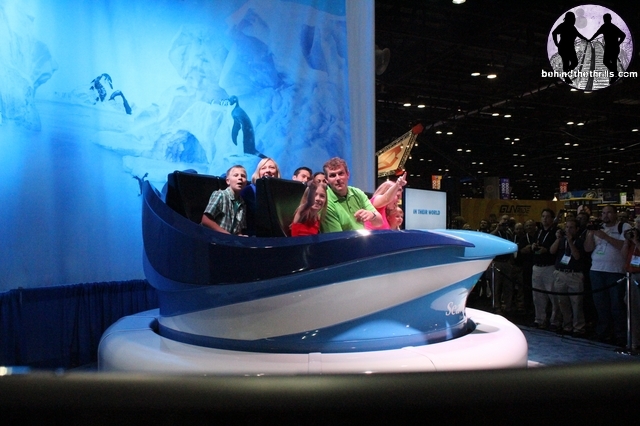 Oceaneering featured the ride vehicle for Antarctica: Empire of the Penguin as the star of the booth. Tuesday morning at 10:30am, they unveiled the never-before seen ride vehicle that will call SeaWorld Orlando home in Spring 2013 when Antarctica opens. Antarctica’s ride vehicle is the first of it’s kind as it features a mobile simulator on a trackless ride system. Families can choose the intensity of their ride as families adventure into the world of the penguins. We also interviewed Brian Marrow, the creative director for SeaWorld Parks & Entertainment in the ride vehicle of Antarctica. 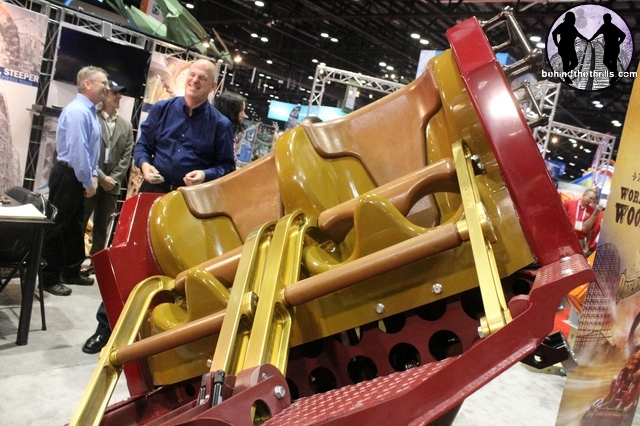 The Rocky Mountain Construction Group featured the train for the new and upcoming attraction in 2013: Outlaw Run. Tuesday at high noon, they unveiled the train for the ride and announced it would be opening in March 2013. 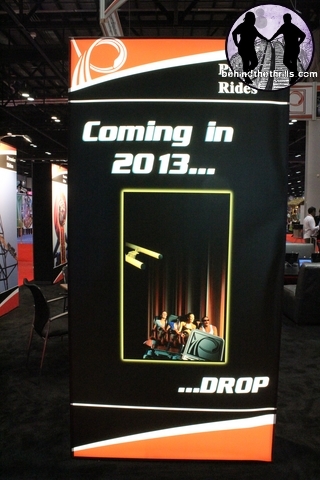 WhiteWater West announced a couple of things today at IAAPA. First off, they announced they are rebranding themselves! 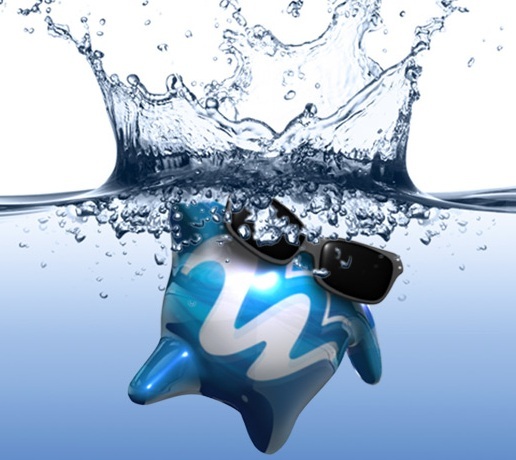 You may have noticed a little blue dude with sunglasses on either on their website. “Orbie” as he is called, is the new “mascot” for WhiteWater West. 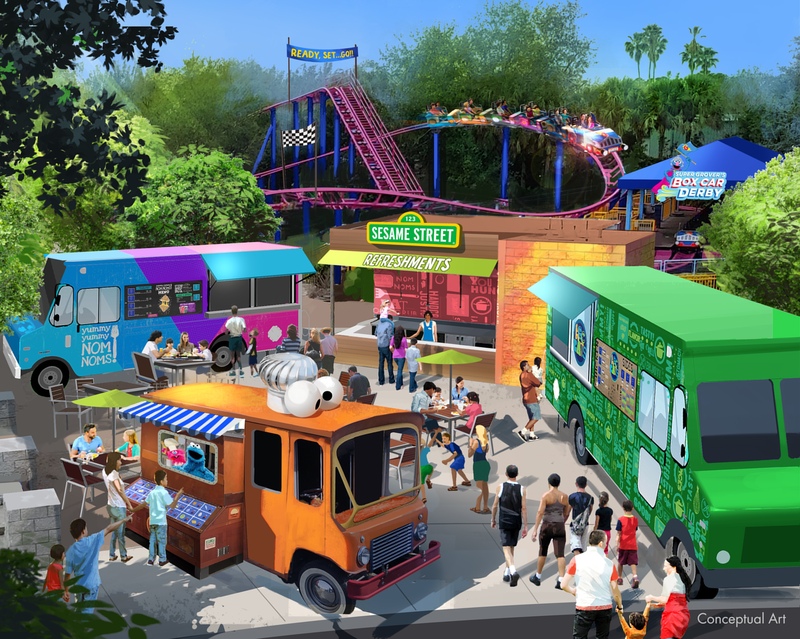 On top of that, WhiteWater announced what is coming in 2013 and 2014, including new attractions and mobile fun! WhiteWater West has acquired Apptivations LLC, which will bring new innovation to the industry. Through smartphone applications, WhiteWater will be able to allow their guests to participate in live action story telling, engage guests, and more. We also interviewed Andrew and Geoff about WhiteWater West. Geoff comments about what might happen in the future with waterparks and how their latest attraction that combines wet and dry play might become the fifth spoke of the water park. For more information about WhiteWater West, visit the official website, and for more information on Apptivations, visit the official website. We interviewed Nathan from Prime Play, which is the “dry” division of WhiteWater West. Prime Play and WhiterWater worked very closely last year to create the Aqua Course. We’ve seen wing riders here in the United States. We’ve already got Wing Rider at Dollywood and a few others, but wing riders are finally on their way over to China. B&M featured the train for “Flying Over the Rainforest”, which will be the first wing rider coaster to open in China. Premier Rides has a lot going for them in 2013. On top of Full Throttle going into Six Flags Magic Mountain, they also have several other new attractions including: Deep Space (Dark Ride LSM coaster), the world’s tallest indoor coaster (coming to China), and a coaster with a vertical track drop. 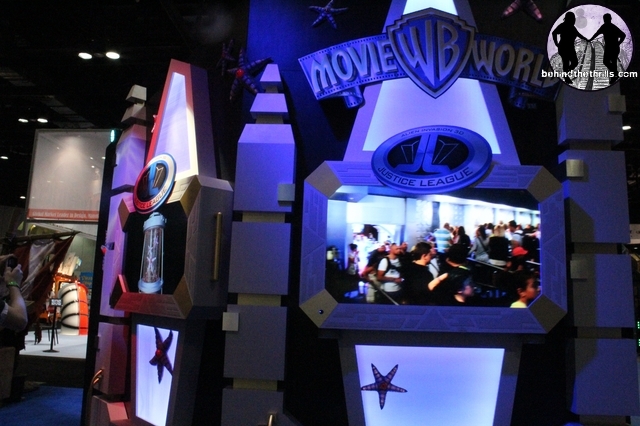 Sally Dark Rides was showcasing some stuff from the Justice League ride they just opened about six weeks ago at Werner Brother’s Movie Land in Australia. The ride features characters from the Justice League (DC comic characters such as Superman, Batman, Flash, ect) as the entire ride is themed around it. It incorporates classic Sally ride elements, plus on-screen shooting. Instead of re-creating Superman and turning him into a model, he was utilized in the ride through the use of CGI. 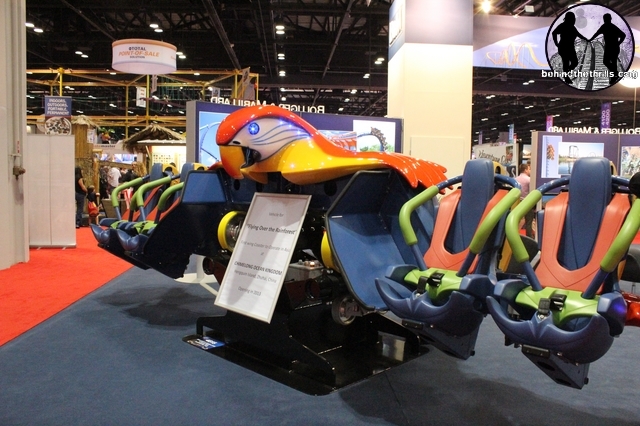 GCI announced a brand new coaster during IAAPA: a Junior Shuttle Launch coaster. You’ve probably seen, and maybe even rode one made out of steel. This coaster, however, will be the first of it’s kind on a wooden coaster. Those tasty frozen dots are celebrating 25 years. Although the company was sold earlier this year, they are still the same delicious dots! 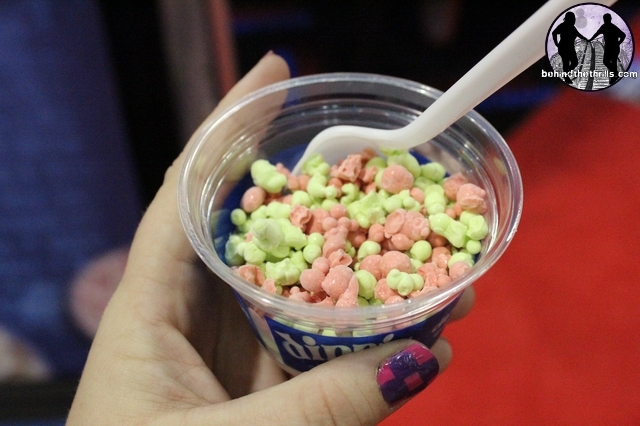 IAAPA featured a ton of interesting flavors including Cherry Limeade and Strawberry Sorbet. The Cherry Limeade is awesome by the way. I wouldn’t be surprised if we might start seeing products similar to Reis & Irvys in theme parks soon. They feature machines with robo arms that make a tasty frozen treat for you! You start off at the touch screen and follow the ordering steps and then you watch the machine make your treat for you. Pale Night Productions produces props for haunted attractions, but they are now getting into the business of creating full haunted houses. We interviewed Kip, the president of Pale Night about some of his products and his inspiration to bring all of this to life. This year was the first time Kip and his team ever created a full scale haunted house. It opened in the Ukraine and could function without actors, but Pale Night also builds in plenty of elements for scare actors to be involved in scaring guests. During the IAAPA expo, Pale Night Productions brought in a 22 foot tall farm house to show what their haunted houses are like. 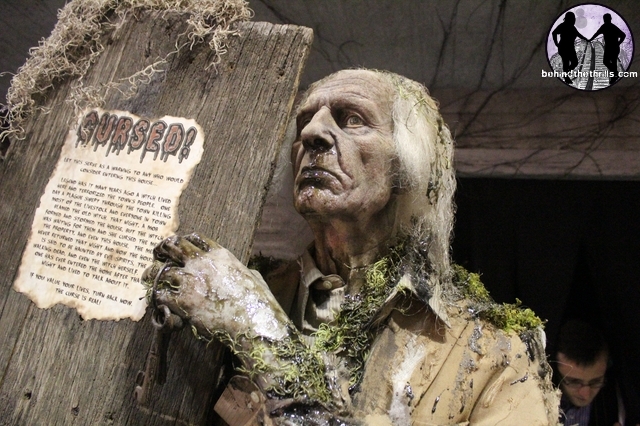 Scare Factory offers props and even a shooting gallery to professional and non professional haunters. This year is their second attempt at a shooting gallery and is a much less scary game than last year’s version. 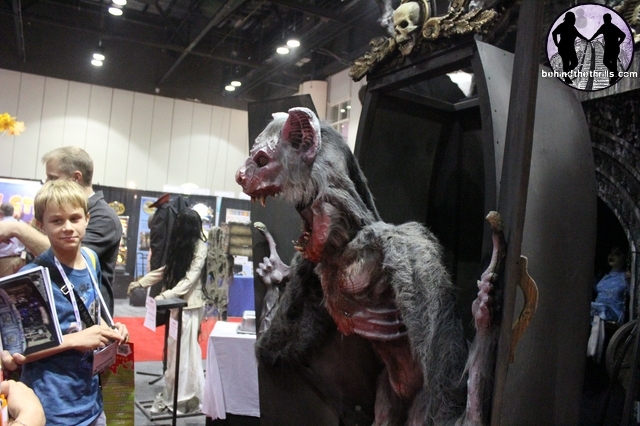 They had tons of creepy and scary props for sale during IAAPA. Funtopia puts a twist on rock walls. They have a rock wall where the “rocks” go in and out of the wall. If you’re not quick enough, you’re sure to have your grip taken away from you and you’ll end up falling. It looked like quite a tough experience, but one that was fun! Funtopia uses safe equipment and is sure to provide thrills (and it won’t harm you at all). Dinosaurs Unearthed is the manufacturer behind Dinosaurs Alive, which has been installed at several Cedar Fair parks over the last couple of years. This year will be no different, as Dinosaurs Alive is scheduled to open at three Cedar Fair parks in 2013. Worlds of Fun, Carowinds, and Valleyfair will all be getting their own Dinosaurs Alive attraction. We interviewed Jennifer Chow about what’s new for 2013. Glitter Body Art is the leading Glitter Art manufacturer on the market. It takes between 3 to 5 minutes to apply the semi-permanent tattoo to your skin, and the best part is after a few days, it will wash off. They offer hundreds of designs to choose from and a good handful of colors to choose from as well. On top of all that, afterwards, the tattoo is dry and you can jump right back into the pool. Lindsey from Glitter Body Art teaches us exactly how these are applied below. This was one of my favorite products at IAAPA. They utilize the same type of process as fudge making on the spot, but in Lip Balm form. They offer more than 30 different flavors that can be combined how you would like them. Flavors include Candy Cane, Lemon, Gingerbread, Peach, Cotton Candy, and more. Daniel’s Woodland might seem a little confusing to some, but they are actually a theming company. The can build theming around.. pretty much anything. During IAAPA they had a tree house and shooting gallery set up. They are known for using reclaimed materials, and when they use new materials (such as cutting a tree down), they use the entire tree. For example, the tree house they built for IAAPA was hallowed out and the part of the tree taken to hollow the tree out was reused to create things like the steps. Lindstrand actually created a giant inflatable dome, but they partnered with another company who projected lasers onto the ceiling of the dome to create a fun and rockin’ show. My first thoughts? Sharks with frickin’ laser beams on their heads! Well, not exactly but close. These guys produce fish that swim around in a tank and they have laser beams attached to their noses so they can “sense” when they are about to bump into something. It’s quite cool. Sandy Mining Creek installs mining troughs. They offer various sizes, depending on what size the park wants. It circulates water through it and you open up your bag of rocks, dump it into the sifter and swift it through the water to see what kind of gems are hidden inside. Now the cool thing about Sandy Mining is that the gems are real (although the quality may not be that of which you’d find in a jewelry store) and their gems come from around the globe. Sandy Mining Creek has an attraction set up within Dollywood, too. You’re probably asking, “How do I get into IAAPA next year?”. 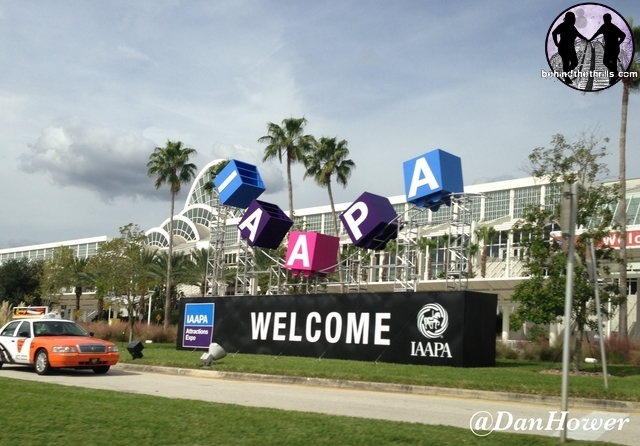 IAAPA is closed to professionals in the industry, buyers, and members of the press. Because IAAPA is such a huge event, it is not open to the public. 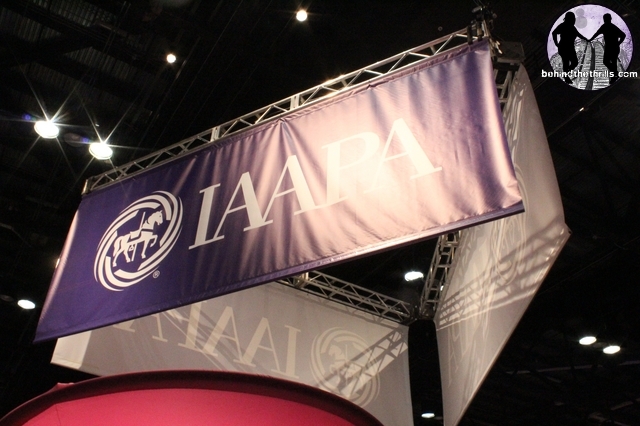 With that said, we would like to thank the public relations team of IAAPA for allowing us to attend this year’s event and see what’s new and hot in the industry for 2013!